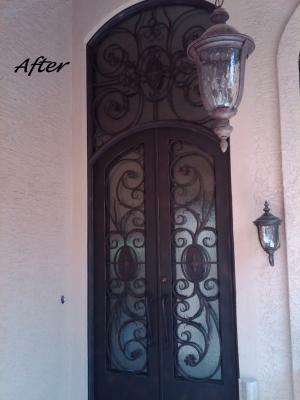 All over the valley, homeowners are choosing Signature Iron Doors for their home remodels and new builds. Our team wants every home owner to know they are getting they are getting high value products for their home. With thick hand forged steel, our doors secure and beautify homes. Our iron artisans create countless designs for every unique homeowner. A few families in East Mesa wanted new iron double doors, so our team created and installed the doors you see featured above specifically for them. The first was for a new build and the second was for a remodel. Now a globally renowned company, Signature Iron Doors emphasizes every detail with exceptional quality. No matter your home’s location, we know how to create a timeless piece to your home. Call us and come visit our showroom in Phoenix Arizona to meet with a sales representative and find out how you can obtain the iron door you seek.